Imagine you’re waiting for the bus, and the guy in the watch ad next to you suddenly starts talking to you. A handful of straphangers in Israel recently enjoyed (if that’s the word) such an experience, thanks to a campaign from Samsung and Leo Burnett Tel Aviv for the Gear S3 smartwatch. The billboard—actually a live video feed—aimed to play up the classic look of the newfangled timepiece, which at first blush might pass for an analog wristwatch, rather than a miniature internet-connected supercomputer. 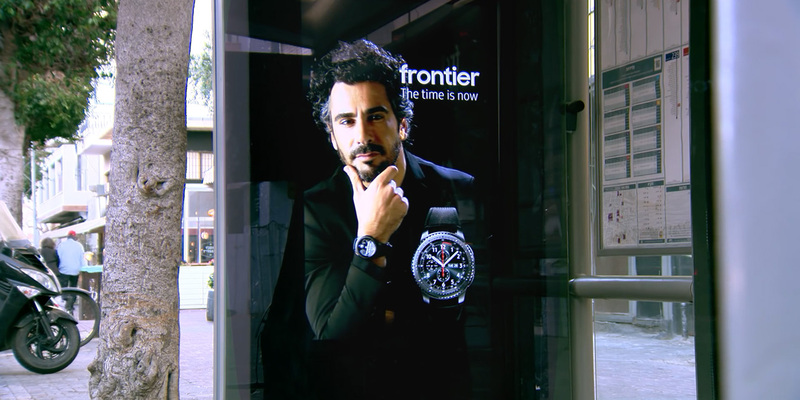 The deception relied on passing off the Samsung watch as a fictional brand, “Frontier,” until the reveal, which came as nearby commuters began playing with their phones, and the actor in the billboard used that as excuse to come to life and start demoing the watch’s capabilities, much to their surprise (if the case study video is to be believed). The precise details of the conversations aren’t entirely clear, being in Hebrew, but the spirit of it—the kind of stunt advertising that’s popular and often staged—is effective enough, mainly because it does speak to the selling point of the product’s aesthetic. It looks like a boring old watch ad, but turns out to be much more (much like the watch itself). Samsung joins a long list of brands in using outdoor digital ads in inventive and interactive ways. Earlier this year in Sweden, pharmacy Apoteket Hjärtat created passive-aggressive billboards that started coughing at nearby smokers to nag them towards a healthier lifestyle. A couple of years ago, the same brand created a subway poster featuring a woman whose hair would blow wildly when a train rolled into the station. There’s also a rich history of bus-shelter ads that are unusual in manners ranging from useful and funny to chilling and rude. The new effort is certainly clever. Whether it’s as persuasive and charming as Samsung’s perspective on working out is a different question. Then again, why choose between the dandy and gym-rat markets, when you can go after both.